"Gaffney was instrumental in helping Lebanon Valley to the Middle Atlantic Conference title." LEESBURG, Va. - The awards keep coming for Lebanon Valley junior Frank Gaffney, who was named a Second-Team All-American by Beyond Sports Network on Wednesday. The outside linebacker is the 12th all-American in program history and seventh under head coach Jim Monos. 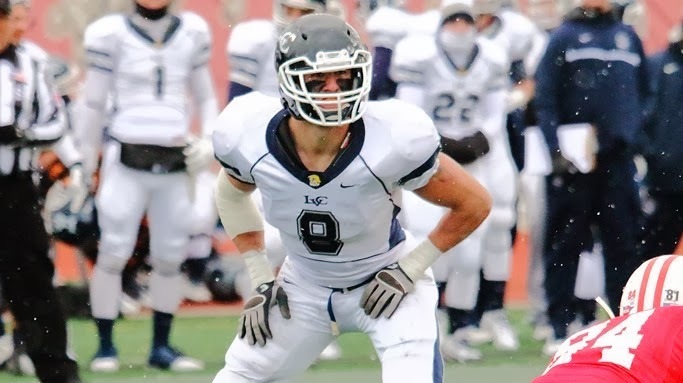 He is LVC's first linebacker to earn all-America honors. Earlier this week, he was named both a finalist for the Cliff Harris Award and First-Team All-East by D3football.com. Gaffney was instrumental in helping Lebanon Valley to the Middle Atlantic Conference title and the program's first NCAA Tournament appearance. The MAC Defensive Player of the Year led Lebanon Valley with 82 tackles, including 63 solo stops, and 19.5 tackles for a loss. His 13.0 sacks were a program single-season record, and he ranked second in NCAA Division III in that category. A disruptive force all over the field, he also broke up five passes and on special teams he blocked three PATs. Gaffney was a two-time MAC Defensive Player of the Week and three-time D3football.com Team of the Week honoree this season.